This free episode has its sweet moments, but it can also get a little mawkish. Back in my day (where we navigated the world using a paper booklet called an A-Z and dinosaurs roamed free), The Awesome Adventures of Captain Spirit would have been a disc demo nestled on the front of our magazine. These days it’s a free download over on Steam and acts as an interactive teaser/mini episode to draw you in for Life is Strange 2. 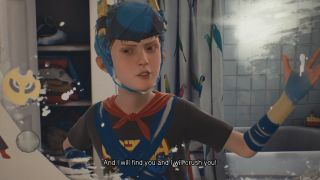 Captain Spirit is the alter-ego of 10-year-old Chris. Chris lives with his dad and loves the world of superheroes and supervillains. It’s both a playspace and a respite from the scarier or more difficult elements of his life, like dealing with the impact of his father’s drinking. I can’t speak to how realistically Dontnod have explored that strand of childhood trauma. Instead I’m evaluating the experience as someone looking to lose themselves in another person’s story, exploring their world. Captain Spirit plays similarly to the original Life is Strange in that you walk around the 3D environments and choose how to interact with various objects. There is some light puzzling where you can find keys to unlock doors or set up a play scene in the garden to act out a superhero encounter. Both the presentation and references planted around the world tie Chris’s experience to the broader Live Is Strange-iverse. You’ve got the indie folk soundtrack and clusters of slow-panning establishing shots which build a similar mood to the earlier game, and then there are mentions of Blackwell Academy and of teens who hop on freight trains to more directly reference the preceding games. But, those moments aside, Captain Spirit tells its own story, and it’s one which feels very hit and miss. Watching Chris play with toys—particularly when he’s talking to a teddy dressed as a superhero sidekick via walkie talkie—is charming. The game also sometimes lets you press E to perform an action in character as Captain Spirit so the imaginary world and the real one bleed into each other in a small but meaningful way—I was reminded that I still pretend I’m a basketball player when I dunk balled-up waste paper into the bin and celebrate accordingly. Chris’s father’s drinking affects pretty much every aspect of the experience. Sometimes it’s achingly sad and effective. Generally these were moments where the devs used a lighter touch like the ability to play Chris as a kid who takes on household tasks because his father can’t. The game also sets up a sense of menace and of unpredictability in the house which meant getting Chris to play one of his mother’s records felt like a real gamble in terms of whether it would lead to a confrontation with his dad. But other options feel like they come from an adult directing the action and not a vulnerable and resourceful kid. The game also tends to be heavy-handed when it wants to provoke emotion. Take the basic setup for example: it’s the Saturday before Christmas and Chris’s dad has absolutely pinky-promised they will go out and get a real pine tree. A child dealing with a heavy-drinking parent at Christmas is low-hanging emotional fruit, so the supporting fiction needs to work hard to “earn” or contextualise that emotion instead of piggybacking off it. Without getting into spoilers, I’d say it’s only partially successful in that. The game is capable of provoking anxiety or empathy, but it often tips into mawkish territory. This is a problem which marred several episodes of Life is Strange, so it’s not a surprise. But Captain Spirit has far less time to cultivate relationships with the characters; it’s easy to feel overtly manipulated, and harder to overlook abrasions. There’s one last caveat here which relates to my experience of the first Life Is Strange. Part of the appeal of Life is Strange was the personal resonance of the story of Max and Chloe. They were important to me in a way that was never dimmed by the game’s flaws. That wasn’t true of Captain Spirit for me, but players with a stronger affinity for the story of Chris and his dad will likely be less irked by the elements which left me cold.